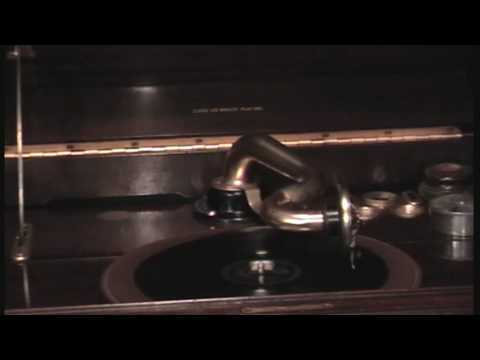 “Ain’t Misbehavin’.” Music by Fats Waller and Harry Brooks, with lyrics by Andy Razaf (1929). Recorded by Elsie Carlisle under the musical direction of Jay Wilbur in London, c. mid-October 1929. Dominion A. 215. For a song that has been recorded well over a thousand times over the better part of a century, “Ain’t Misbehavin’” seems particularly evocative of the time of its conception: the year 1929, in the months preceding the stock market crash. It was composed for an all-black musical revue called Hot Chocolates which was so popular with audiences at the popular Harlem speakeasy Connie’s Inn that it moved on to the Hudson Theatre on Broadway, where it had 219 performances. It was at Hudson Theatre during the run of Hot Chocolates that Louis Armstrong had a sort of Broadway debut; he played “Ain’t Misbehavin’” on the trumpet during intermissions. Credited co-composer Harry Brooks, who has been occasionally dismissed as a mere arranger of the song for Hot Chocolates, would later explain that the tune of “Ain’t Misbehavin’” was written in imitation of the beginning notes and bridge of Gershwin’s 1924 song “The Man I Love.” Fats Waller claimed that the title “Ain’t Misbehavin’” was a reference to his inability to misbehave in alimony jail, which is where he claimed to have composed the song. Andy Razaf, who outlived Waller by three decades, would later explain that Waller was misbehaving in misleading people: Razaf had come up with the title and the lyrics in Waller’s house in New York, where they finished the whole song in 45 minutes. It is ironic that Elsie’s recorded image would later make an unintentional appearance in what would appear to be a rather pornographic 1974 movie (I have not had the pleasure of seeing it myself) entitled Ain’t Misbehavin’, in which old footage is used of her singing “My Canary Has Circles Under His Eyes,” along with Fats Waller singing “Ain’t Misbehavin’” and “Honeysuckle Rose” (and Django Reinhardt playing Gershwin’s “The Man I Love,” and who knows what else that appears in this article), all interspersed with vintage lewd footage – or so I am told. In the summer of 1929 there were American recordings of “Ain’t Misbehavin’” by the Charleston Chasers (with vocals by Eva Taylor), Ben Selvin’s Bar Harbor Society Orchestra (going under the name “Jerry Mason and His Californians, with Irving Kaufman singing under the pseudonym “Robert Wood”), Leo Reisman and His Orchestra (Lew Conrad, vocalist), Louis Armstrong and His Orchestra, Gene Austin, Ruth Etting, the California Ramblers (as the Golden Gate Orchestra), Irving Mills and His Hotsy Totsy Gang (with Bill “Bojangles” Robinson singing and tap-dancing), and Fess Williams and His Royal Flush Orchestra. Composer Fats Waller recorded his own piano version of the piece on August 2, 1929 and would revisit it on a 1938 record made with his band (“Fats Waller and His Rhythm”) in which he sings the lyrics, but perhaps his most memorable performance is in the 1943 film Stormy Weather, made just before he died. It could be argued that he risked being upstaged by his own eyebrows in one scene. Autumn 1929 saw British bands begin to record this Jazz Age anthem. On October 8, Jack Hylton and His Orchestra, with Sam Browne as their vocalist, made two records, one of standard length, the other a longer “concert arrangement” on a twelve-inch disc (Billy Ternent being the arranger); both versions involve recurrent allusions to George Gershwin’s “Rhapsody in Blue.” That same day Bidgood’s Broadcasters also recorded “Ain’t Misbehavin’,” and as the season progressed there were versions made by the Rhythmic Eight, Hal Swain’s Café Royal Band, Ambrose and His Orchestra (with vocalist Lou Abelardo, in a Lew Stone arrangement), Arthur Roseberry and His Dance Band (as Bert Maddison and His Dance Orchestra, with vocal refrain by Len Lees), Cecil and Leslie Norman’s Savoy Plaza Band (Cavan O’Connor, vocalist), Nat Star and His Dance Orchestra (as Eugene Brockman’s Dance Orchestra), and Percival Mackey’s Band (with vocals by Billy Milton). Jim Kelleher’s Piccadilly Band recorded two takes of “Ain’t Misbehavin’” that were never issued. In November, Harry Jacobson sang the song while playing the piano, accompanied by the Edison Bell studio orchestra directed by Harry Hudson (you may hear it in John Wright’s British Dance Band Show podcast #275, at 8:09). In this latter rendition, the band musically cites “Rhapsody in Blue” (at 9:35), much as Jack Hylton’s orchestra had done. It is said that the censors, who were very active in the Lord Chamberlain’s office in those days, vetoed the issue of further copies when the dreadful deed was discovered. The subsequent fine reportedly put Dominion out of business. Brian Rust. The American Record Label Book . New Rochelle, NY (1978) 101. It is worth noting that Rust does not particularly insist on the veracity of this industry rumor, and indeed he goes on to point out that Dominion’s financial position at the time was so poor that it would have collapsed anyway. If the company had been fined, one would expect that there would be a record of the penalty in some government office, but no such evidence has ever surfaced, to my knowledge. True or false, this is a story that people like to repeat. They look at their coveted copies of Dominion C 307 with their simple black-and-white labels and want to see them as precious contraband. They take delight in listening to the risqué disc and feel a sudden, intimate connection to a supposedly historical scandal. The suggestion that “My Man o’ War” is not just naughty but criminally transgressive evokes the common motif of the subversive artist taking on a repressive society, and one takes vicarious pleasure in thoroughly enjoying something once forbidden (albeit morally pedestrian in terms of today’s popular music). 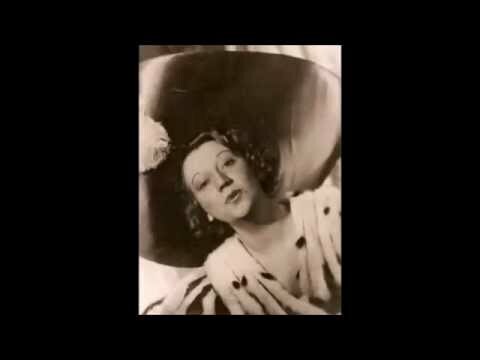 I would like to focus on the genuine artistic merits of Elsie Carlisle’s Dominion recording of “My Man o’ War” (and of the Filmophone version that she did over a year later), simply because it is an exceedingly clever composition artfully interpreted by a consummate mistress of comic music. Which is not to say that a pretty girl singing a smutty song is not of perennial fascination. “My Man o’ War” was composed by Spencer Williams, with words by Andy Razaf, and was published in New York at the beginning of 1930. 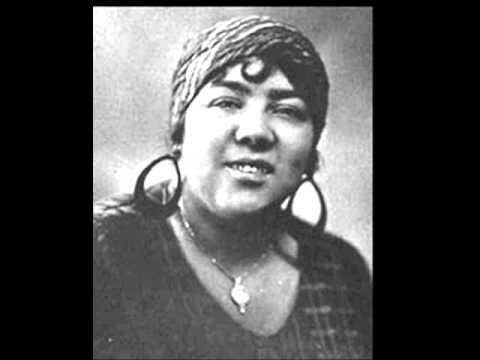 Razaf, a prolific lyricist (and interestingly also a member of the deposed royal family of Imerina, now Madagascar), helped to write other songs that Elsie Carlisle sang, including “Ain’t Misbehavin’,” “The Porter’s Love Song,” and “My Handy Man,” the latter being almost as sexually suggestive as “My Man o’ War” (with which it is paired on Filmophone 143). The lyrics of “My Man o’ War” involve an extended metaphor in which a woman compares her lover to a soldier and her bedroom to a battlefield. The rhetoric ratchets up quickly from simple comparison (“My flat looks more like an armory”) to sexually suggestive expression (“Takes out his bugle when he sees me”) to raunchy double-entendre (“At night he’s drilling me constantly”). And gets me in the rear. The first recording of “My Man o’ War” features blues singer Lizzie Miles accompanied by Harry Brooks on the piano. 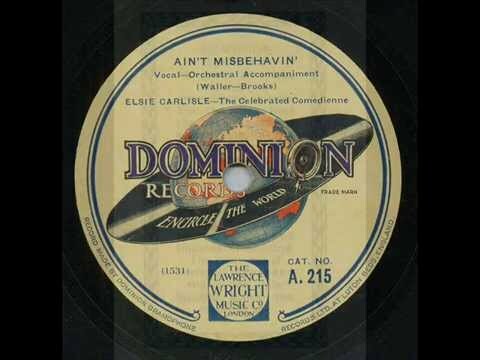 Victor 23281 was recorded in New York on January 27, 1930, only a few weeks before Elsie Carlisle did her Dominion version. The tempo is slow, almost mournful, but Miles’s voice is powerful, and the attitude that she projects is brazen. It is hard to tell if she is complaining about or rather boasting about her lover’s indefatigable prowess in bed, and the ambiguity contributes to the comic effect. 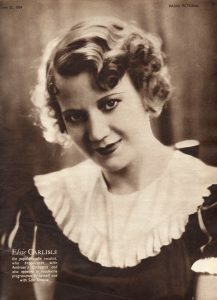 Elsie Carlisle made her first recording of the song in March 1930 with Dominion Records, when Jay Wilbur was still musical director there. The differences between her version and Lizzie Miles’s are striking. The latter’s hint of bragging is replaced by Elsie’s girlish persona of mock-innocence and mock-earnestness. The tempo is faster (with more complex orchestration to make up for the lost time), and Elsie’s delivery is more varied. She feigns shock, surprise, and exhaustion; her voice quavers wearily. 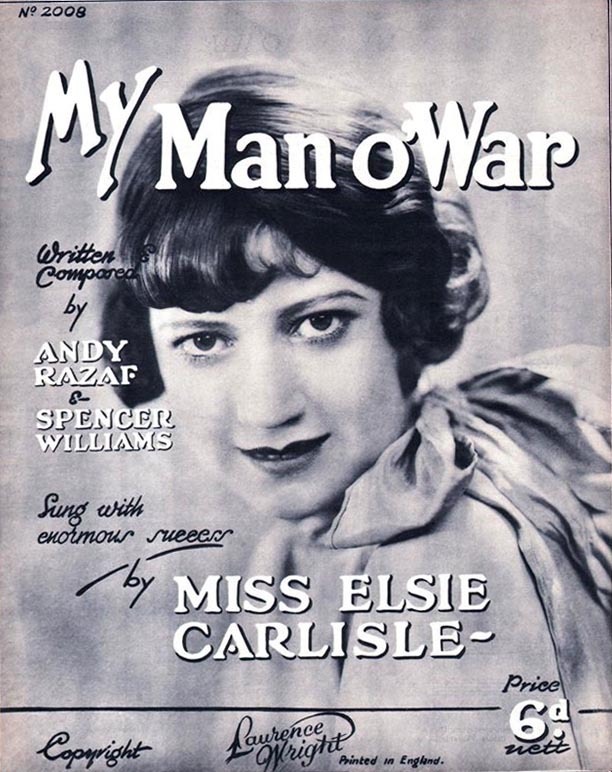 In short, Elsie’s performance is dramatic in character, and what less would we expect from a veteran of the musical theater who had only a year before introduced the world to Cole Porter’s “What Is This Thing Called Love?” (supposedly at the composer’s own request).1 In “My Man o’ War,” she does not merely sing naughty lyrics beautifully; she conveys a persona that suggests innocence but delivers filth, and the incongruity makes the song uproariously funny. Whether or not there really was a problem with the authorities over this record, Dominion’s finances were in ruins, and in July Jay Wilbur quit his job as musical director to take up a similar position at Crystalate (where Elsie would start recording again the next month). Elsie seems to have gone on a four-month recording hiatus after “My Man o’ War,” but it is clear that she kept busy, even appearing in an experimental Baird Television broadcast in June. The Dominion recording turns up again over a year later, in mid-December 1931, this time reissued on the physically less friable, decidedly floppier Filmophone 143. Whereas the earlier Dominion record had had Elsie’s rendition of the comparatively respectable “Body and Soul” on its other side, Filmophone 143 is pure impropriety; its reverse side has her singing Razaf’s “My Handy Man,” another example of sexual innuendo (in this one, the singer declares that her man “greases [her] griddle, churns [her] butter, strokes [her] fiddle” – you get the idea). Many, but not all, copies of the Filmophone record have the pseudonym “Amy Brunton” on them, but it is not clear that Elsie was really distancing herself from the song. The Lawrence Wright sheet music of the time features nothing but a striking photograph of her on the cover, and she ultimately recorded a second version of the song that appears on many pressings of Filmophone 143. In the second version of “My Man o’ War,” Elsie sounds less naïve, more confident, more mature; in other words, somewhat more in on the joke; and yet the humor is not diminished. It is in fact somewhat enhanced by the addition of Max Goldberg on the trumpet, who introduces comical variations on the idea of a military bugle. The song is punctuated at the end by a collective sigh suggestive of sexual passion subsiding. 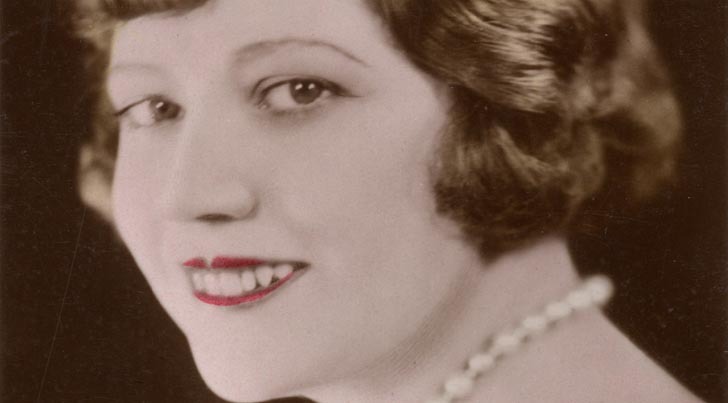 Elsie Carlisle was particularly good at singing ribald songs because she combined a beautiful voice with an ability to project a comical persona and a knack for letting her voice quaver or falter dramatically at just the right moment. She could use these talents on occasion to make a song edgier. Whereas the Andrews Sisters’ 1939 version of “Oh Johnny, Oh Johnny, Oh!” suggests a mere teenage crush, Elsie’s 1940 version, with the same lyrics, has so much vocal frustration, urgency, and excitement in it that it seems considerably less innocent. This ability to add or enhance sexual innuendo with dramatic vocal effects was, however, but one of Elsie Carlisle’s talents. We have seen that “My Man o’ War” on Dominion C 307 is the flip side of Elsie’s moving rendition of “Body and Soul,” and her very next record (Imperial 2318) has her sublimely touching “Exactly Like You” on it. Her tone of vulnerable, bittersweet optimism in her 1932 version of “The Clouds Will Soon Roll By” with Ambrose and His Orchestra (HMV B 6210) provides a further example of the range of passions that she could evoke – but one has to admit that she was rather good at singing a dirty song.